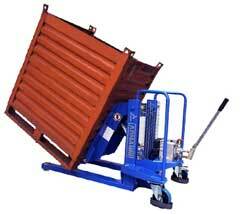 Thanks to its simple design the ALFA MRF Manual Stacker is designed for tilting tanks and pallets. It is easy to control thanks to the use of lateral shackles. This manual stacker is operated with a hand pump, which gives the operator greater control over the load which the stacker is moving. A quick descent control is located in the handle of the hand pump (similar to a pallet truck), the ALFA MRF is easy to control and maneuver, with and without a load. The ALFA MRF has a simple manual lever system; with this it is possible to tilt the load sideways with an inclination of +/- 20°. The ALFA MRF can also tilt vertically, the pump acts on the inclination of forks, ensuring a maximum inclination of 85°. The current regulations in terms of safety at the workplace impose very strict limits on the manual movement of loads by the operator; therefore, the ALFA MRF series represents the simplest and most economical solution in order to move and tilt tanks and pallets in compliance with the current regulations.